Every school deserves to have at least one teacher as charitable and distinguished as Mrs. Devin Michel Way, for it is teachers like her that cause positive change not only in their own classrooms, but across the staff and beyond. Mrs. Way is a superlative example of an educator who cannot help but give of herself, and who moves through her practice with grace, no matter how large the task and no matter how much she offers to do. Her generosity of spirit builds relationships and trust, and on that foundation Mrs. Way acts as a guide for students and staff to learn and grow. A kindergarten through fourth grade teacher at Port Graham School for the last three years, and a veteran teacher of eleven years, Mrs. Way is a master at differentiating for each and every student across five grades. For many, teaching five grade levels would be daunting, if not impossible, but Mrs. Way succeeds extremely well. Her expertise has grown from her unique experiences, including teaching preschool in Pennsylvania, fifth grade in the Marshall Islands, and a span of preschool to elementary grades in the village of Point Lay. Watching Mrs. Way’s classroom is akin to watching a tightly choreographed dance. Students know the steps, established early on, and learn happily in a relaxed, student-centered environment. Mrs. Way makes this dance look easy, and in her nurturing manner, Mrs. Way provides support to all. While soothing a crying kindergartener, she might chat with her fourth graders about a theme in a novel. All the while, other students are launched on their independent or collaborative projects. Too, over the year, students’ projects branch out into the community to provide service. She is truly an amazing teacher. Without being asked, Mrs. Way assumes a high level responsibility at Port Graham School beyond the classroom in communications, public relations, and day-to-day functions. Without a principal on campus four days per week, there are myriad challenges, including scheduling variances, community concerns, guest speakers, special events, student support, staff absences, mechanical issues (such as recently testing a generator! ), internet outages, and nameless other issues. Mrs. Way cheerfully helps with these challenges. She communicates regularly with her principal, and follows protocols. She keeps parents informed of school activities, and acts as editor on the school Facebook page. She engages with all students, not just her own. She also coaches middle school cross country running, is the Assessment Coordinator, school librarian, and serves on Port Graham Site Based Council. She provides stability for the entire school. Mrs. Way does this all with a gentle spirit, willing attitude, and love for people. A particularly extraordinary aspect of Mrs. Way’s practice that goes above and beyond is her remarkable ability and eagerness as a professional development facilitator for Port Graham and Nanwalek Schools. This role began as a stipend position, during which Mrs. Way exceeded expectations by fully facilitating in-services, early release days, and collaborations. When the stipend was no longer available, she stepped forward to continue, and leads collaborative sessions for all instructional staff in both locations that could be likened to seminars led by professional facilitators. With a sensitivity to the needs of our K-12 rural schools, agendas center on initiatives such as personalized learning and ConnectED, with practical applications to multi-graded settings. With poise and a touch of authority, Mrs. Way facilitates new concepts, engages meaningful discussions, and requires participants to collaborate on products that can be applied to current practice. 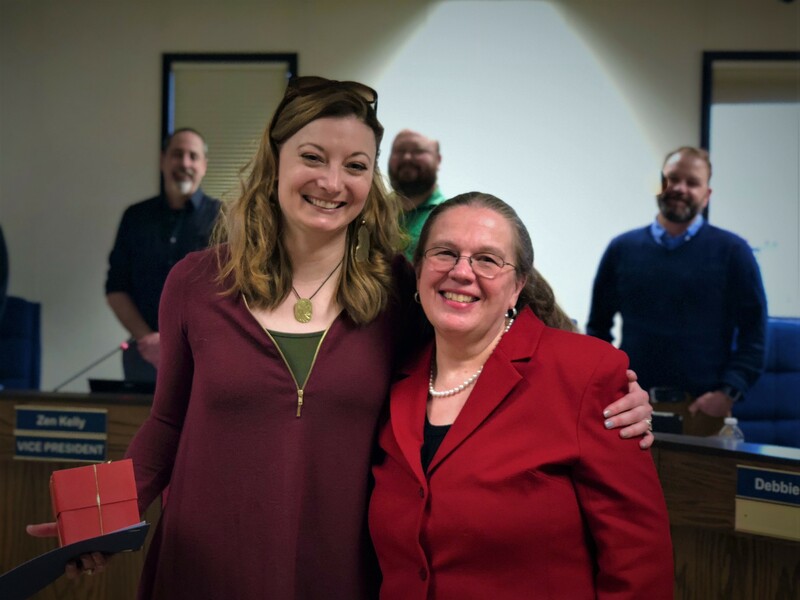 The Kenai Peninsula Borough School District Board of Education is proud to recognize Mrs. Devin Way for her dedication to the students of the school district, past, present, and future. This entry was posted on March 5, 2018 at 7:03 pm. You can follow any responses to this entry through the RSS 2.0 feed. You can leave a response, or trackback from your own site.